Grab has launched its new Regional Centre of Excellence where it will house its core business strategies and operational functions, with an aim to create 400 jobs within the year. According to the company, the new space will create more employment opportunities for various industries — such as data scientists, software engineers, creative designers and those in the legal profession. Grab Malaysia country head Sean Goh said about 300 jobs will be for regional and research and development (R&D) purposes, while the rest will be for people supporting local businesses. “The new centre will be able to accomodate about 1,000 people…we will look into setting up a finance hub here as well,” he told reporters at the centre’s launch in Petaling Jaya yesterday. Among the divisions set to occupy the 54,000 sq ft office space include legal, customer experience, financial services and creative services. Goh declined to disclose the amount of investments allocated for the centre, but maintained that the company has invested “hundreds of millions” into Malaysia alone. “The reason why we don’t disclose the figures is that it is uncapped — we want to invest as much as it takes. The investment does not just go into the local businesses, but (it) moves across all eight countries,” he said. 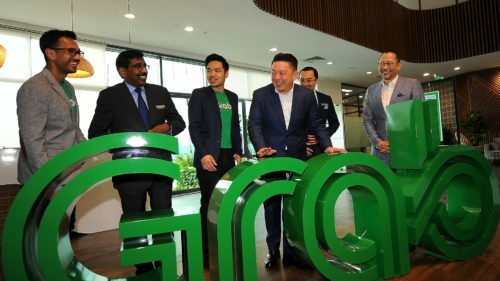 The R&D centre will focus on finding safety solutions and capabilities for South-East Asia as Grab continues to double down on its global investments for advanced technology, data science, artificial intelligence and machine learning. Goh said all the investments and efforts of the company so far have been in line with the government’s call for public-private partnerships to help drive Malaysia towards the Industry 4.0 blueprint.